CONVENTIONAL opinion is that the global propylene market is moving from a balanced position to a balanced-to-tight position in 2018-2020. This will justify a significant wave of new investments is a common view. It is time to think again. We had expected Chinese propylene demand to grow by 6.9% in 2018 over to 2017. 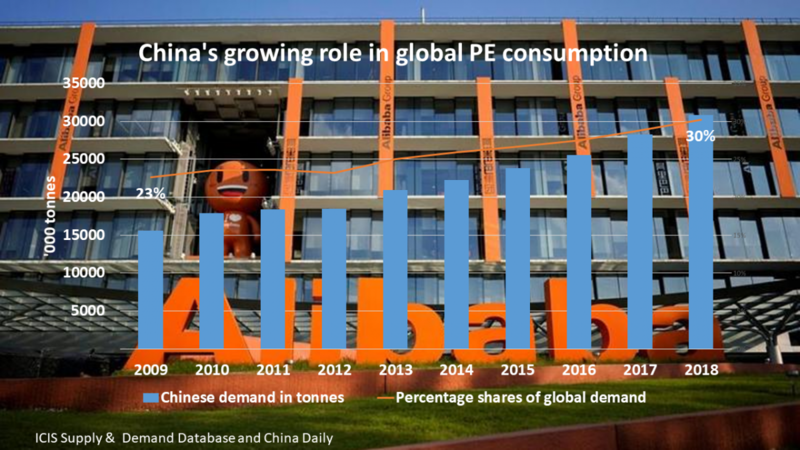 This would have left China’s consumption in 2018 at around 33.3m tonnes. The growth in China would have represented a staggering 47% of total global growth, by far the biggest percentage growth of any country or region. China’s economic slowdown has instead hit consumption growth very hard. As I discussed on Friday, the biggest derivative of propylene, which is PP, is likely to have seen 2018 demand growth at 4.7% versus our earlier forecast of 6.5%. I estimate that this will have resulted in the loss of some 341,000 tonnes of propylene demand versus are earlier expectation. Three of the other biggest propylene derivatives – acrylonitrile, propylene oxide and acrylic acid – look set to have seen 2018 demand growth significantly short of forecasts. This will lead to a combined loss of a further 352,000 tonnes of propylene growth compared with what we had expected. Other derivatives look as if they will have grown about the same or better than we had forecast. 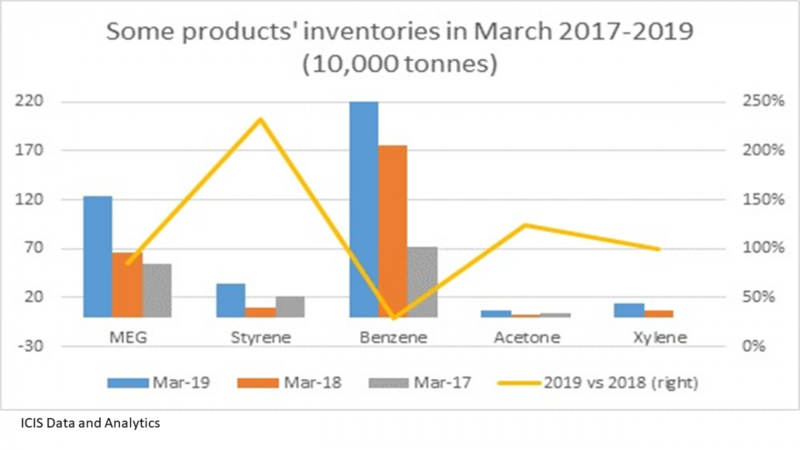 Put all of this together and I estimate that China’s propylene demand will have only grown by 4.8% in 2018 – a net loss of around 665,000 tonnes of new demand versus our earlier forecast. 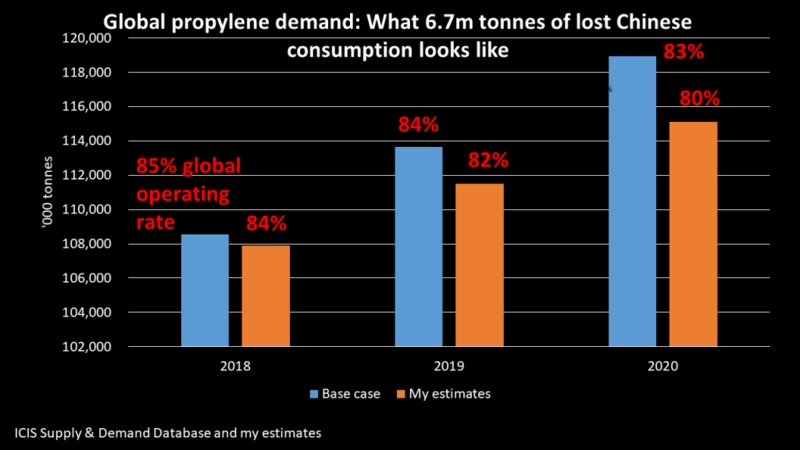 This would leave last year’s propylene demand at 32.6m tonnes. 4.8% would represent the lowest growth in six years. You should plan for further disappointing growth in China’s propylene demand in 2019 and 2020 as China continues its deleveraging process. 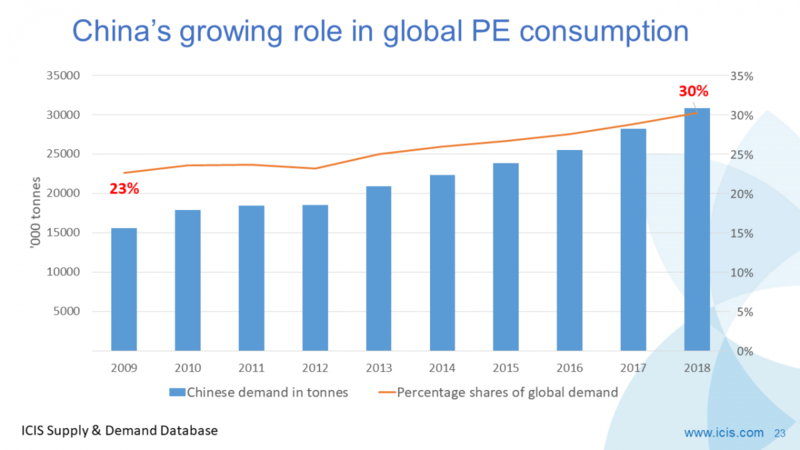 Let’s assume for argument’s sake – and this of course is now pure guesswork – that China’s propylene demand in 2019 grows by 3% over last year with 2020 growth at 5% (this would compare with our base case forecasts of growth of 7.5% in 2019 and 9.3% in 2020). The end-result would be a loss of a huge 6.7m tonnes of demand versus our base case. Way too pessimistic? Not necessarily. 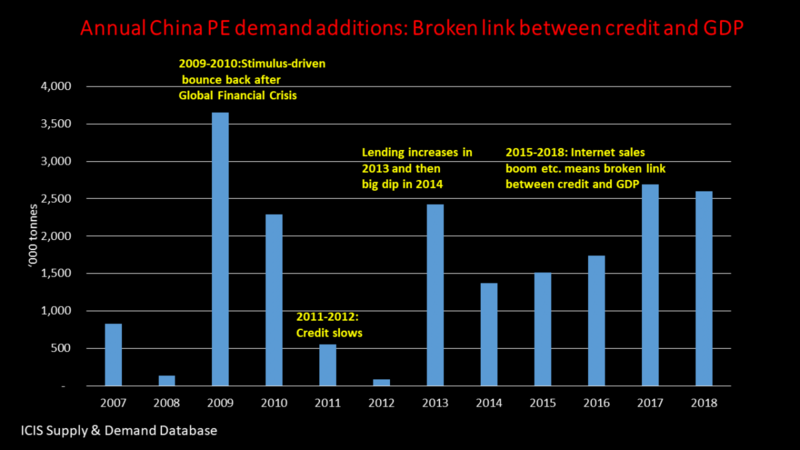 Take a very close look at these Credit Suisse views on the Chinese economy. The bank cautions that an outlying surprise for 2019 is that China suffers a hard landing. It defines this as real GDP growth slowing to sub 5% (the lowest real GDP growth recorded in the past 40 years – i.e. since the reform and opening up by Deng Xiaoping – was 3.9% in 1990). A hard landing is a strong possibility even if the trade war comes to an end, as last year’s slowdown had little to do with the trade war. It was instead about deleveraging. 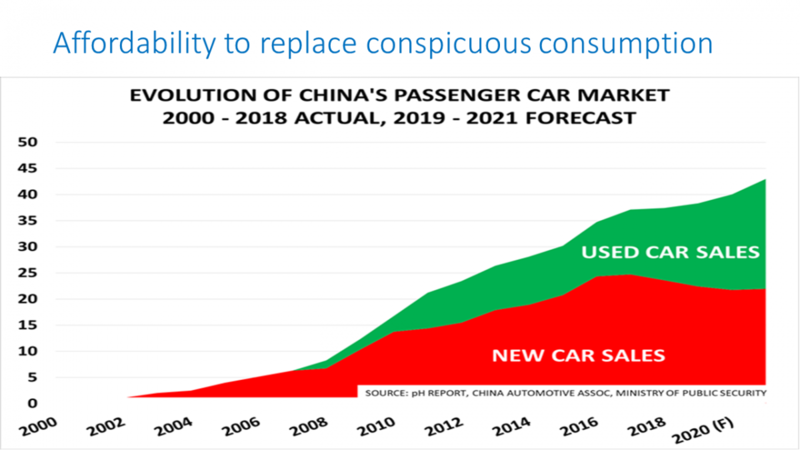 And no matter what the Chinese government does this year to re-stimulate the economy, the law of diminishing returns means that, economic stimulus on a net basis will be less than the enormous, unprecedented stimulus of 2009-2017. Between 2000 and 2008, China accounted for 40% of global demand growth as its actual consumption jumped from 4.4m tonnes to 11.3m tonnes. The 11.3m tonnes was a long way behind Europe at 16.8m tonnes and North America at 15.4m tonnes. In 2009-2017, as China poured trillions of dollars of stimulus money into its economy (around 50% of the total global stimulus of $33 trillion), China was responsible for 60% of global propylene growth. During this period, China’s actual consumption saw a quite staggering increase: From 12.1m tonnes in 2009 to 31.2m tonnes in 2017. European and North American consumption was by 2017 lower than in 2000 at 16.4m tonnes and 15.2m tonnes respectively. 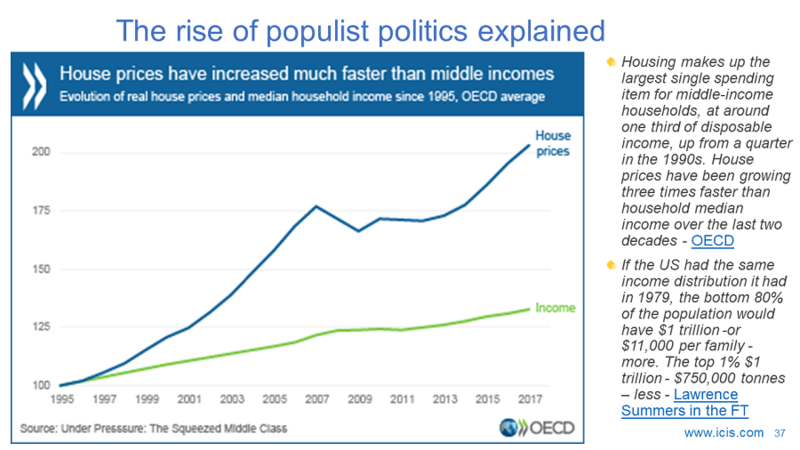 “But what about booming emerging markets in general because of the rise of the region’s middle classes?” you might be asking. Slogans don’t equal data. In 2017, the whole of the Asia & Pacific region, which includes the Indian subcontinent and Southeast Asia, consumed just 11.3m tonnes of propylene. South and Central America’s demand was 3m tonnes. If your reaction to all the above is “too many numbers” then I am afraid you are in the wrong job. The numbers really matter. 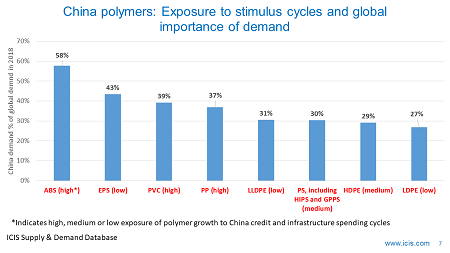 They clearly tell us that the global propylene industry is way too dependent on China for growth, as is the case with all other petrochemicals and polymers. Global consumption during those three years totals 334m tonnes as opposed to 341m tonnes. Worldwide operating rates dip to an average of 80% from 82% with sharp declines in 2019 and 2020, as the chart at the beginning of this blog post illustrates. This would quite obviously not be the end of the damage. No economy is an economic island, least of all China. China has accounted for 36% of the global growth since 2013 and accounts for 16% of world GDP on current exchange rates, adds Credit Suisse in the same analysis I refer to above. If China growth were to slow to just 4% that would take 0.4 percentage points off global growth directly, says the bank. But the total impact would be about double the size because the foreign trade multiplier, it adds. My number crunching hasn’t taken into account the knock-on effect of any loss of Chinese consumption growth on other countries and regions. 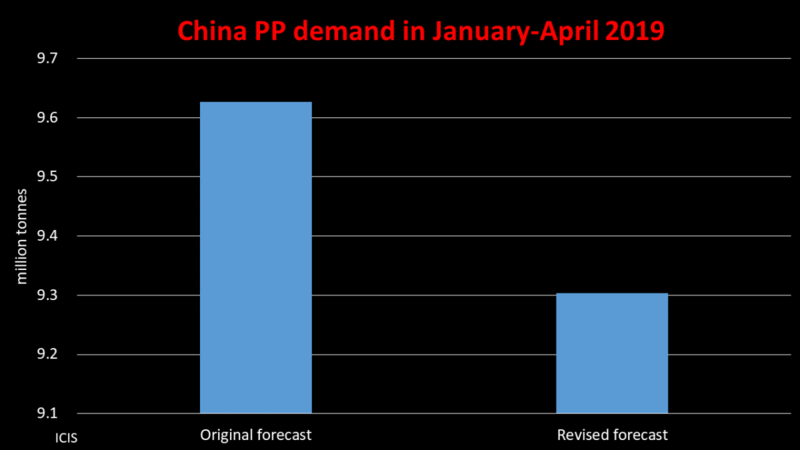 So, even if my 6.7m tonnes guesstimate of lost Chinese demand is way off the mark, what of lost demand elsewhere? Get your spreadsheets out and start calculating. Local new propylene investments to serve local markets that are in deficit might well still work, such as the ones being planned in Europe. There will certainly be plenty of cheap propane available to support this type of spending. But new facilities primarily based on China-driven tightness in global propylene have become a lot harder to justify.